Echipa AVmall incearca sa mentina acuratetea informatiilor din acesta prezentare. Cu toate acestea, in anumite cazuri, pot aparea mici inadvertente pentru a caror semnalare va suntem recunoscatori. Ne poti contacta oricand pentru a clarifica eventuale nelamuriri. Nu uita sa mentionezi in corespondenta ta numele exact al produsul. Fotografia produsului Boxe Yamaha NS-PB150 are caracter informativ si poate sa difere de produsul real sau sa contina accesorii neincluse in pachetul standard al produsului. Specificatiile tehnice pot contine erori de operare si pot fi schimbate fara instiintare prealabila de catre producator, neconstituind obligativitate contractuala. 5.1-channel speaker package for serious sound enthusiasts. A focus on natural and spacious sound quality ensures complete enjoyment of both music and movies. Advanced YST II subwoofer provides strong bass with outstanding clarity. Elegant black woodgrain-like surface speakers are a nice match for black flat-screen TVs. Front, centre and surround speakers are wall mountable. This 5.1-channel home theatre speaker package ensures that HD audio sources such as Blu-ray Disc™ realise their full sound potential. Maintaining ideally balanced sound from low bass to high treble, these speakers help to prevent listener fatigue even after long periods, for unfailing enjoyment of music and movies. All of the speakers are constructed of MDF (medium density fiberboard), a uniform wood material with excellent resonant characteristics. Their large volumes produce beautifully resounding, richly detailed sound. All of the speakers use an 8cm (3-1/4”) cone woofer (the centre speaker has two woofers) and 1.4cm (1/2”) balanced dome tweeter. Because they all use the same high quality speaker units, the sound is smooth and uniform, for a natural feeling. Yamaha′s newly developed Advanced YST II (Yamaha Active Servo Technology II) combines negative-impedance and constant-current principles to drive the speaker cone with even tighter control than previously. 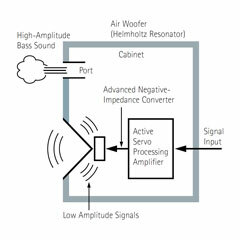 Using Advanced Negative Impedance Converter (ANIC) circuits, this system dynamically optimises effective speaker impedance to maintain excellent linearity. This means more stable and accurate low range response, not to mention higher sound pressure levels, for more natural and energetic bass reproduction. The Linear Port helps to ensure smooth bass response, while minimising extraneous. These high quality speakers are designed to be able to fit on top of an AV rack. With their beautiful black finish, they complement flatscreen TVs to provide an elegant home theatre appearance. Weight 2.1 kg; 4.6 lbs. Weight 8.5 kg; 18.7 lbs. Nu sunt recenzii pentru Boxe Yamaha NS-PB150. Fii primul care scrie una!